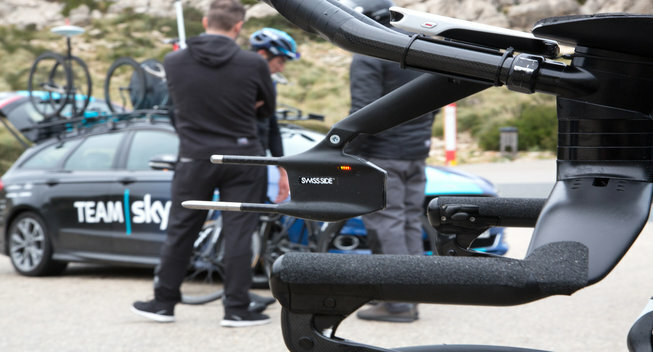 The high performance engineering experts of Swiss Side, who specialise in aerodynamics, have agreed a deal to become the Official Race & Aerodynamics Simulation Partner of Team Sky. With over 50 years of experience in Formula 1, Swiss Side - the 'one-stop shop for performance engineering’ - are the market leaders in aerodynamics, bringing their expertise to the world of cycling to help maximise speed. The partnership will see Team Sky work closely with Swiss Side to enhance the team’s performance strategy around racing, with a specific focus on time-based events. The performance strategy covers everything that can have an impact on racing, such as equipment choices, environmental conditions, road conditions, landscapes and physiological capabilities of individuals and groups of riders. Swiss Side’s approach quantifies performance out on the road where it matters, making aerodynamic measurements using their CdA (aero drag) measurement device, aligned with multiple other data sources, with the data then fed back into the ‘virtual pitwall’ race strategy simulation tool, as well as into all future development work. The unique part of the Swiss Side development process and approach is the ability to link all data inputs together to gain an understanding of what it takes to get the best out of the rider and equipment to go faster. Swiss Side focus on development and optimising the areas identified to have the biggest impact on performance and speed, dominated by aerodynamics - a method they call the Swiss Side 4-arm development approach. No.1 in aerodynamics, maximises speed and real world performance of aero wheels. With over 50 years of Formula 1 experience, Swiss Side’s new technologies and unmatched engineering know-how revolutionise the cycling industry.